In the book “Creative Unemployment: How to be Healthy, Wealthy, Happy and Free” by Darwin Ouderkirk, the author’s main point is to share the lessons of obtaining health, wealth, happiness, and freedom from the many self-help and personal development books the author read. This book is a compilation of famous quotes and affirmations from motivational leaders such as Zig Ziglar and Wayne Dyer. While reading the book, it is clear the author possesses a desire towards ideals of living a more carefree, happy life. The passion of the author’s purpose of writing the book is admirable and clear. Although the passion for the subject matter is apparent, the writing unfortunately does not match the passion. The biggest setback toward the book is that it was disorganized and lacked focus. An example of the disorganization was the pieces of advice or affirmations with no introduction or transition to the reason it was there. Numerous editing errors should have been caught prior to publishing. My personal opinion of the book is although the author exhibits passion towards writing self-help, it showcases a lackluster attempt at motivational, inspirational writing. I do understand the author’s purpose in wanting to write the book yet it was challenging for me to finish the book due to the grammatical and formatting errors in addition to the lack of focus. My favorite part of the book was the mantras strewn throughout the book. One of my favorite mantras was CAFÉ: this stands for clarity, awareness, focus, and execute action. It is a creative abbreviation with strong meaning. The other mantra I liked was ANTS, which is an abbreviation for automatic negative thoughts. In order for the reader to encompass these mantras, the mantras were repeated at the end of each section. My recommendation is for the affirmations and quotes to be at the end of each section compared to being scattered throughout the chapters. It would have helped the book to be more focused and structured. From this organization, it also would have portrayed which were the author’s own words, and what was the re-telling of the words of motivational leaders. Another recommendation would be to add a summary at the end of each chapter on what was advised. 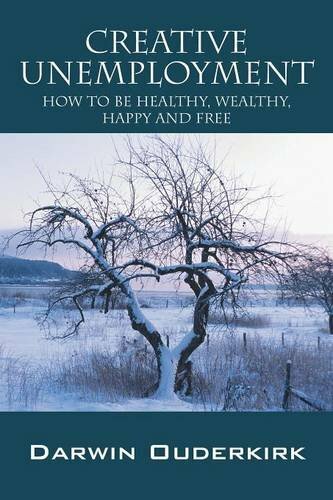 Overall, I found that after reading “Creative Unemployment: How to be Healthy, Wealthy, Happy and Free” by Darwin Ouderkirk, it was still unclear on how to be healthy, wealthy, happy and free. A professional edit to clean up the structural organization as well as the grammatical and formatting errors would be of immense benefit.